Not sure on the VIN tag, but I just checked CMSNL and it appears it does go to K9. I believe k5-k9 are all identical with the exception of some different graphics, probably why most parts come up as k5 or k6 designation. Found an eBay deal with the clutch cover, stator cover and all the missing components for the auto clutch for a great deal. The stator cover has a small hole in it but I'm going to try and weld it up with some low temp aluminum rods. Pretty happy with this purchase as I got the whole lot for the price of what a used stator cover usually goes for. Tank is on the way. Only one 78 model tank was available on ebay, and its not in the best shape but for the price it was worth the gamble. There's a small hole that will need welded up but the rest looks solid. Comes with the cap and petcock as well, which pretty much covers what I paid even if I can't save the tank. Next step is to pull apart the clutch basket and see whats usable, then make a list of parts to order to rebuild it. Hopefully I can save the outer basket and just replace the throwout bearing and plates. We shall see. Wish I could find one of these around here really cheap. I want a Z50 or a CT70 real bad. Good thing my garage is full of stuff needing finished. 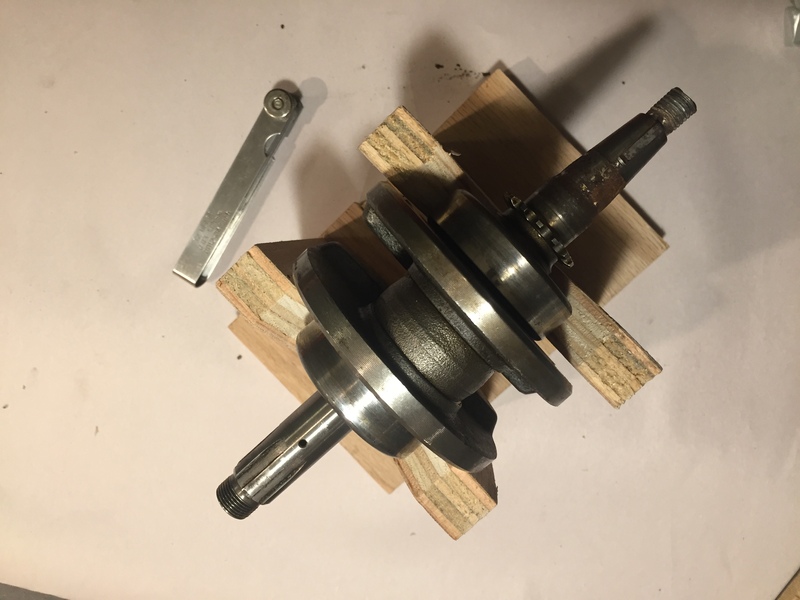 After work last night I made a couple of v-blocks out of some scrap 3/4" birch plywood so I could check the runout on the crankshaft. I set them up on a piece of 1/4" plate so I could use the magnetic attachment on my dial gauge to prevent any movement. 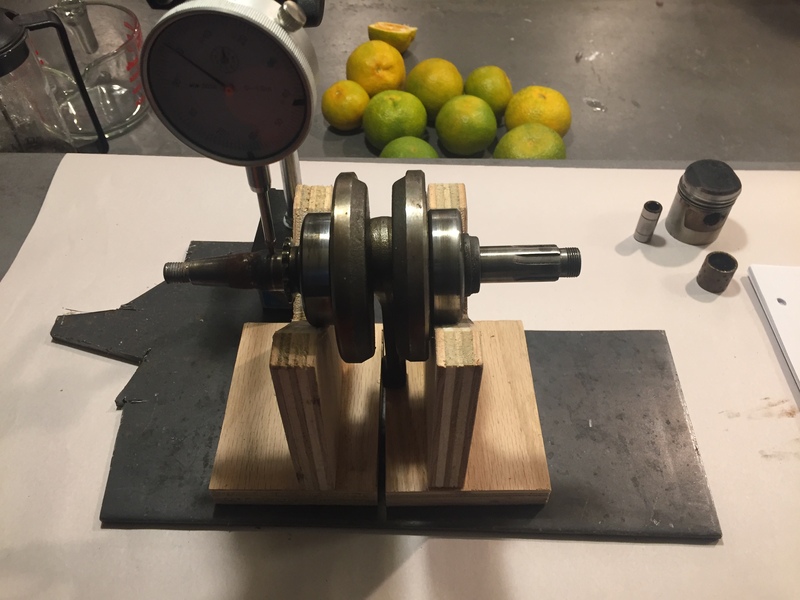 Everything measured within spec so we have a good usable crankshaft to build out from. The clutch side bearing is toast as it was full of dirt and grit from broken case covers, so that'll need to get replaced, but that's not a big deal at all and about a $10 part. Now that I've confirmed the crankshaft is in spec, I'm going to go ahead and order gaskets, oil seals, a couple bearings and a bunch of random parts like crush washers, nuts, piston rings, and all that good stuff to build up the engine.